After reading about everyone’s home-grown Canadian goodness this past week I was inspired to plant my own tiny version in my backyard. I have been longing for a backyard garden of my very own for a long time and this year I was finally granted both a yard and some dirt in order to make this Domestic Goddess’s dream come true. I had decided to wait until S. and my brother had had a chance to get the fence built. This fence may have taken a while but it sure is a thing of beauty, even without the gates on. S. and I are both very proud of our wee house with its teeny backyard and this gorgeous fence. So yesterday all of a sudden I found myself standing in the middle of a garden centre, Leith loading up the bottom "shelf" of the garden cart, and me loading up the top. I managed to convince him in the end that we only needed one purple basil plant and no Geraniums, but it was a positive outcome over all. He can be very helpful in garden centres it turns out – I never would have found the tomatoes if it weren’t for him pointing at all the little yellow, red and green fruits (vegetables?) saying "ball! ball!". So we brought home a small flat of plantables and S. told me it was up to me to do the dirty work. So this morning while he and Leith were out running errands and visiting Aunties I dug my fingers into some seriously black earth and planted my little heart out. Just think of all the amazing dishes that will be enhanced by my fresh thyme, basil, chives, tomatoes and hot peppers. I searched and searched for rosemary but there was none to be found. We might have to head out again today so I can get some at another nursery. 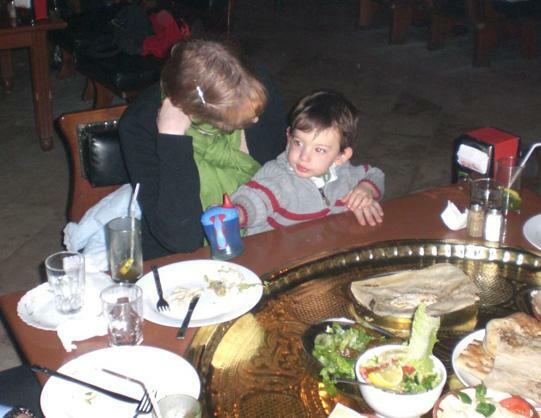 While in Amman, S’s uncle took us to an incredible restaurant, Reem Al-Bawadi. A traditional Jordanian restaurant, known for its tasty food and great atmosphere, we had a fantastic time and some even more fantastic food. First of all it’s a huge restaurant, about the size of a Toronto city block. You walk in to this cavernous hallway where there are men playing drums, a woman serving Turkish coffee and another making the traditional, large, thin flat pancake-like bread/pita which is served with dinner. Leith had a wonderful time looking at everything and everyone, including his first sight of a sheep (real but stuffed and mounted) and a cow (head only). He literally stood there pointing at them saying “Moo” and “Maa” and would have happily done that for hours if we had let him. Leaving the enormous entry-way and entering the restaurant was akin to stepping back in time and into culture at the same time. Sitting in the restaurant is like sitting in one gigantic luxurious Bedouin tent. You sit at a huge, very low to the ground table that has a big tray set into the middle of it. S’s uncle ordered and that tray was soon filled with delicious appetizers…Hommos, Labaneh, Tabbouleh, Baba Ghnooj, Stuffed Grape Leaves, Kebbeh and some Cheese Samosas. 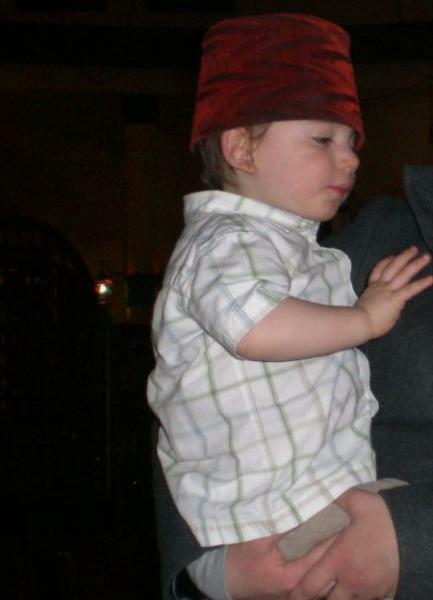 Of course, I was full after the appetizers, which always happens to me, I can’t help it. Then dinner arrived, again ordered by S’s uncle. There were plates and plates of Kabab and as well (I think ordered specifically for me since I mentioned that I like fish) grilled fish. The fish was probably the best I have had in my life (maybe even better than when I used to catch fish up at my cottage and grill it fresh from the lake). The waiter brought the whole, grilled fish to the table, de-boned it in front of us (I think there were actually 4 plates of fish), squeezed some lemon on it and presented it to those of us who wanted it. Once I had had S. dispose of the head for me, I quickly dug in, forgetting how full I was moments ago. I ate the whole plate myself and could have eaten more if there had been any. I later asked my mother-in-law how they cook it, if they put anything in particular on it…she told me it’s just salt and pepper and lemon juice and a bit of oil. You can bet I’ll be buying whole fish at the market sometime soon and making it for S. and I. After dinner, coffee is served by a man in a strangely familiar uniform (I’m sure I’ve seen it in a movie at some point). I love the tradition and culture the place is steeped in, from the atmosphere to the music (they put on a “show” mid-dinner with a traditional wedding drum dance) to the food. Some people might find this sort of experience hokey but I just sat back, watched the smile on my husband’s face and enjoyed one of the best meals I’ve had in a long time. I guess you deserve an explanation as to why I have been absent for two weeks…I have received more than a few frantic emails asking where I am and if I am okay. I am fine and my absence was not health-related this time, thank goodness. Kuwait City and Amman, Jordan. Recovering slowly from the jet-lag and the awful head cold I managed to catch on the way there has kept me busy since arriving home. I promise to be back in the kitchen cooking and baking up a storm in the next few days. The trip was fantastic; one I will never forget. Kuwait City was much nicer than I had been expecting and also much bigger than you’d think, considering how tiny the country looks next to Saudi Arabia and Iraq. We did a lot of shopping, some sight-seeing and entirely too much eating (if that is indeed possible). Of course the food was fabulous – from a bag of steaming Falafel from a street vendor to gourmet Iranian and Indian food in the roof-top Sheraton restaurants, I couldn’t ask for a better foodie experience. Leith fell in love with freshly-made strawberry juice while we were there, and also the concept of "more" was learned quite quickly by him…as the waiters spoiled him non-stop. We spent one night in a chalet on the shore, about an hour outside downtown Kuwait City. 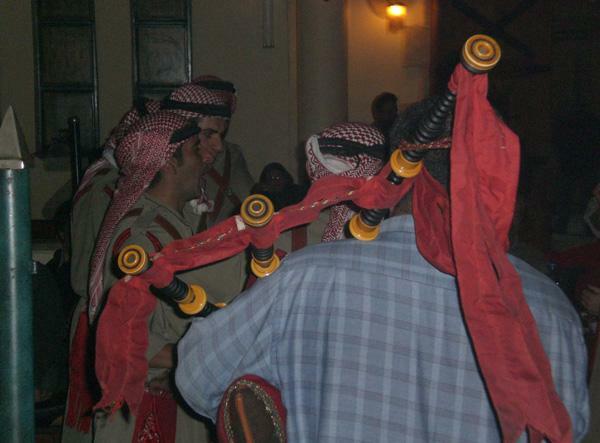 There Leith got to stick his feet in the Persian Gulf, ride a horse, take a trip on a train and eat hot, freshly made gooey cheese-filled and Zatar-covered Fatayer in a tent made of Camel Hair. On to Amman, Jordan, where S’s parents have a flat in which we stayed for an all-too-short four days. The Kunafah (phyllo spread with soft cheese, topped with more shredded phyllo and a thick sugar syrup poured on top), which they are known for, was scrumptious…I could have eaten a whole sheet-pan. We brought home some really delicious Baklava for my sister and sustained ourselves through the very (very, very) long flight home with Fatayer and other scrumptious pastries from a bakery near the airport, aptly named "Paradise". My favourite food experience during this trip would have to have been the grilled fish from an amazing restaurant that S’s uncle took us to in Jordan…details to come very soon, I promise! Unfortunately I forgot my camera’s memory card at home so we have only a few pictures of the trip, taken mostly by my brother-in-law. 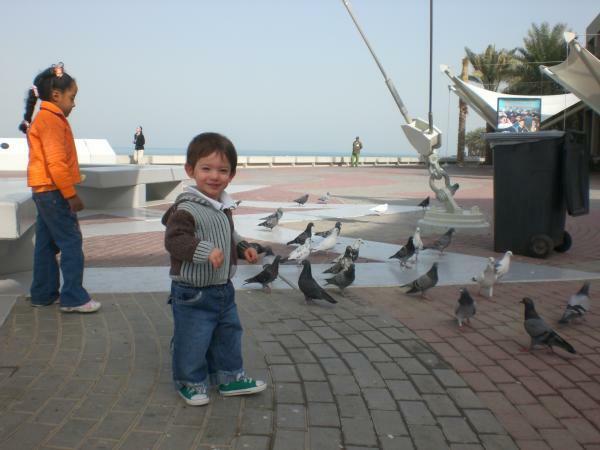 The picture above is of Leith, happily chasing pigeons outside the Scientific Center in Kuwait – he had an absolutely amazing time.